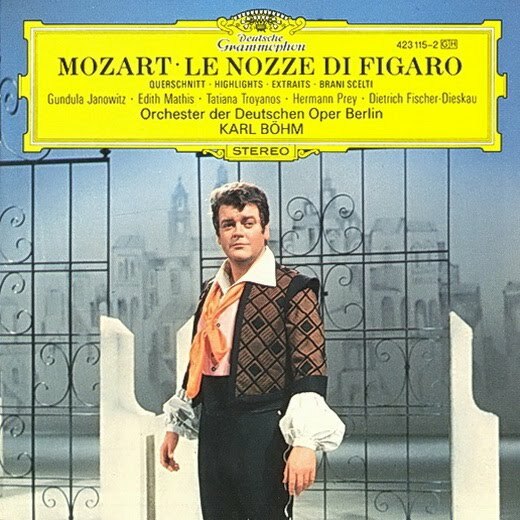 Hermann Prey as Figaro. Album cover © 1968 Deutsche Grammophon. 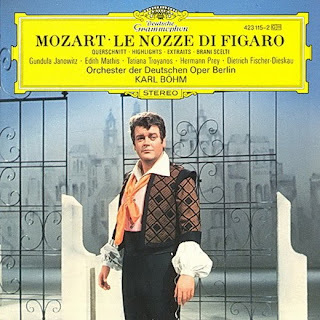 As I am slowly working my way through Brilliant Classics' Complete Mozart Edition, I thought this would be a good time to talk about one of the greatest comic operas ever written, Le Nozze di Figaro. With many recording on the market, it can be confusing for the consumer, especially since those great havens of wisdom--record stores--are disappearing from our urban landscape faster than Kathleen Battle from the Metropolitan Opera roster. Better yet, none of these are full price recordings, except for the Gardiner, which is due for a cheap-o DG Collector's Edition reissue one of these days. Anyway, to launch a new semi-regular feature here at the blog, we are going to look at five recommended recordings of this great opera, in chronological order. Next week, we'll do another. And so on. Enjoy! The heavyweight champion. Finally given a proper CD mastering in 1999, this effervescent performance by the senior Kleiber with the Vienna Philharmonic is anchored by a phenomenal cast, which includes Hilde Gueden, Cesare Siepi and Fernando Corena. And did we mention the Goddess of Vienna, Lisa della Casa, radiant yet mournful as Mozart's Countess. With Hermann Prey as Figaro and Dietrich Fischer-Dieskau as Almaviva, this German-flavored recording has a pair of very strong leads. Rich comic timing, crisp, nimble performances and a great Mozartean at the helm. A loveable Figaro and the first one I reach for. And with a cast that includes Gundula Janowitz, Edith Mathis and Tatiana Troyanos, can you blame me? Originally pressed on Decca's now-defunct period label L'oiseau-lyre this was the first Figaro on period instruments. Östman is a sure hand at the podium, leading his radically reduced orchestra and a fresh cast (featuring future superstar Barbara Bonney) through a complete performance of this opera. Includes an appendix with the often cut arias for Basilio and Marcellina in the final act. A marathon Figaro but a satisfying experience. Currently available (with three of Östman's other Mozart recordings) as a super-bargan box set from Decca. Gardiner's fussy, quicksilver conducting dominates this live recording made at the Theatre du Chatelet and filmed for release on VHS and DVD. In fact, this was one of the first opera DVDs released by DG back in 2000. The recorded debut of Bryn Terfel as Figaro, alongside a strong cast of future stars that includes Rodney Gilfrey and Alison Hagley. Pamela Helen Stephen is an excellent Cherubino. Hillevi Martinpelto gives an emotional, carefully weighted portrait of the Countess, the perfect, irresistible compliment to the macho bluster of the two male leads. This is a finely-balanced recording that is currently available as part of the mammoth Complete Mozart Edition from Brilliant Classics. Recorded in Belgium, it features period playing of exceptional clarity and beauty from Le Petit Bande, and a cast of mostly unknown singers that excel in the opera's complicated ensembles. Well-recorded and well performed, with excellent choral singing. When the audience applauds at the end of Act I, it's a pleasant shock as there is little stage noise. Il Trovatore at the Met. Detail from Pilgrimage to St. Isidro's hermitage by Francisco Goya, used as the show-curtain in the current Met production of Il Trovatore. The new David McVicar staging of Il Trovatore is the perfect fuel for Verdi's fiery drama. It may not meet the Enrico Caruso standard of "the four greatest singers in the world," but last night, Marcelo Àlvarez, Sondra Radvanovsky, Dmitri Hvorostovsky and Dolora Zajick came pretty close. The dramatic excesses of Trovatore make perfect sense in McVicar's wasteland staging. Past Met productions of this opera (most recently, the unmitigated, never-revived Graham Vick disaster of the 2000 season) chose to mock the excesses of Salvatore Cammarano's superb libretto. 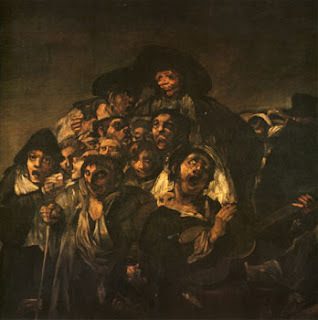 But this production (inspired by the late "black" paintings of Goya) embraces them, creating a war-torn wasteland dominated by a giant depiction of Christ tortured on the cross. The bleak, rotating set (by Charles Edwards) consists of crumbling walls and damaged iron gratings, not to mention a huge witch-burning stake that echoes the upstage crucifix and reminds the audience of the opera's central tragedy of mistaken identity. In this hell-world, the forces of destiny are the only things that seem to make any sense. 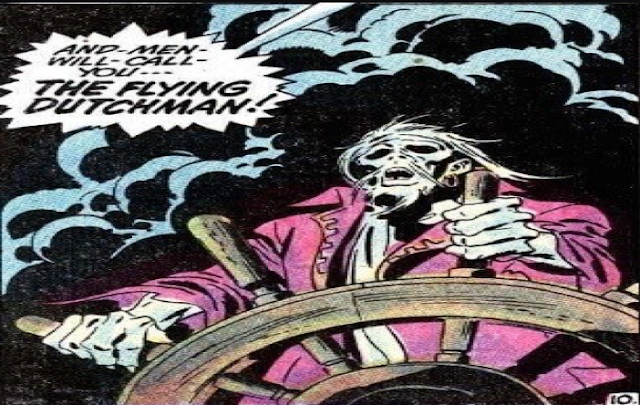 Everyone is doomed, and no one here gets out alive. Libretto, sets, and staging are only a framework to hang great vocal talent upon. This production has four aces up its sleeve--all spades. Marcelo Àlvarez has evolved into a full, rich spinto tenor, fulfilling his potential with a Manrico that is equal parts bel canto singing and vocal heft. His "Di quella pira" ended on a high B, not a high C, and he did run out of breath holding it. But, he recovered nicely and hit the pitch squarely the second time. Better yet was his seductive offstage opening aria and the emotional heights of the Miserere scene. Sondra Radvanovsky rocked the house as Leonora, one of two difficult Verdi heroines of that name. Like the Forza Leonora, Radvanovsky's character ricochets through the Spanish landscape, from lady-in-waiting to aspiring nun, blushing bride and finally, resigned suicide. Her opening "Tacea la notte" (ably aided by the restrained conducting of Gianandrea Noseda) was a gorgeous flood of sweet, creamy tone and delicate soprano filigree. She was facile and nimble in the cabalettas: those old-fashioned high-speed arias that have flummoxed many a would-be Leonora. And her final "D'amor sull'ali rosee" drew in and involved the audience, making it seem like drinking poison (rather than marrying the baritone) was, at that point, a girl's only reasonable option. On the other hand, Dmitri Hvorostovsky was visually and vocally gorgeous as Count di Luna, exuding the right blend of sexuality and madness that makes one question Leonora's decision to off herself rather than marry him. He cut an imposing physical and vocal figure, and floated an amazing pianissimo phrase in the middle of "Il balen del suo sorriso", a moment where lesser singers elect to blast through the notes and hope for the best. Sublime. Despite a run of bad stagings of Trovatore (we're not even going to mention the 1980s "giant staircase" production by Ezio Frigiero), the Met has always had a great Azucena: Dolora Zajick. From "Stride la vampa" to her final confrontation with di Luna, this is one of the great portrayals in opera, filled with hysteria, horror, rage and tender moments with her "son." Zajick hit some astonishing low notes last night, and produced a solid, dramatic performance that never once veered into cliché. Neither did this superb Trovatore.